I met with Marta Węglińska, who graduated from the Poznań University of Arts in 2016, to discuss her Tendency to Collapse exhibition at the Zachęta Project Room that features an amalgamation of works created in different mediums, including installation, photography, drawing, sculpture, artbook, dance video and performance. A universal thread demonstrating Węglińska’s coherent perspective on the nature of human existence subject to constant change runs through the exhibited pieces. Marta Węglińska, ‘Tendency To Collapse’ – exhibition, Zachęta Project Room, still from the movie. Michalina Sablik: Your stay in Indonesia has clearly inspired the works featured in the Tendency to Collapse exhibition at the Zachęta Project Room. Why Indonesia? How did you end up on an island? Marta Węglińska: Some of my works draw on the culture on Java, but only the film and batik paintings were actually made on location. I lived in Indonesia for one year on the international Darmasiswa RI scholarship. Meanwhile, I participated in two residency programmes founded by Polish artists in the RedBase Foundation, as well as the Sesama Art Center, both located in Yogyakarta. Initially, I worked mainly on batik paintings inspired by the fascinating mythology and culture of Java, especially folk dance, 16th-17th century literature, symbolism and local beliefs on nature. In the first couple of months, I devoted the bulk of my time to in-depth research so that my inspiration could be substantiated by hard facts instead of mere visual impressions. Batik painting is a long, arduous process. You can only imagine how long it took me to complete six large-scale batik paintings. Only one of these pieces, the most minimalist of the lot, was displayed in the Zachęta exhibition. Marta Węglińska, ‘Tendency To Collapse’ – exhibition, Zachęta Project Room, photo Weronika Wysocka. M.S. 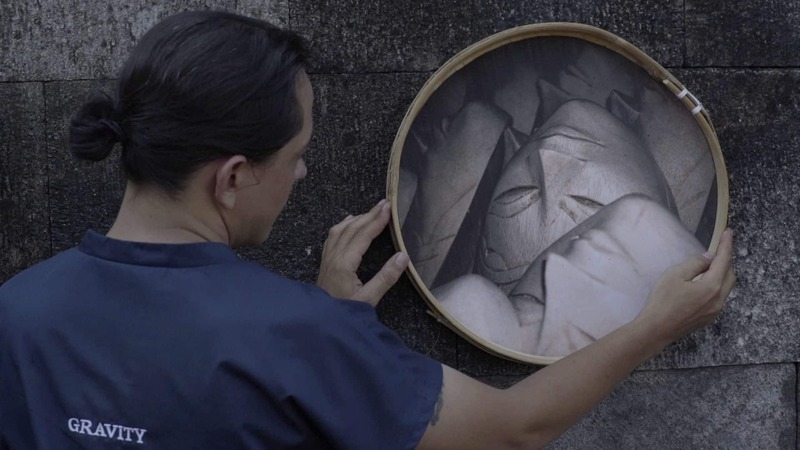 : The eponymous film was made in collaboration with some indigenous artists. How did you meet and invite them to work with you on the project? M.W. : I started working on The Tendency to Collapse during my second visit to Indonesia, so I already knew how to get in touch with some people. Adi Semali, a graduate of the Film School in Yogyakarta who was in charge of cinematography and editing, played a crucial role in the creation of our film. Not only did he help me a great deal with the film production and seeking permission to shoot on historic sites, but he was also kind enough to translate Javanese and Indonesian into English during our rehearsals with performers. I auditioned two traditional dancers (Anter Asmorotedjo and Anita Listyaningrum) and a master of local martial arts (Ruben Pangingkayon), who were recommended to me by my colleagues. The music was composed by J Mo’ong Santoso Pribadi from Indonesia. M.S. : How did you work on the film? M.W. : My basic concept evolved through a series of meetings I had with the performers. A detailed script drafted prior to obtaining any information or knowledge about traditional Indonesian dance and pencak silat (local martial arts) would have been completely useless. Together, we delved deep into the symbolism and connotations of martial arts at dozens of joint practice sessions. Afterwards, we explored various sequences of movement to arrive at the choreography that would convey the film’s message: “Gravity is a constant desire to fall.” The final version of our performance embodies notions such as confusion, doubt, loss of balance, downfall, misconception and error. Amid a pre-established meaning of certain gestures that allow you to build and follow the narrative, there is no universal language of dance in Indonesia. The local oral tradition encompasses more than gesture and choreography, and can be interpreted loosely. It’s also worth mentioning that body movement is closely linked to the verbally expressed narrative in the film. MS: The gallery space seems to be taken over by the ruins of an old temple. Could you tell us more about the structure’s origin and reference? M.W. 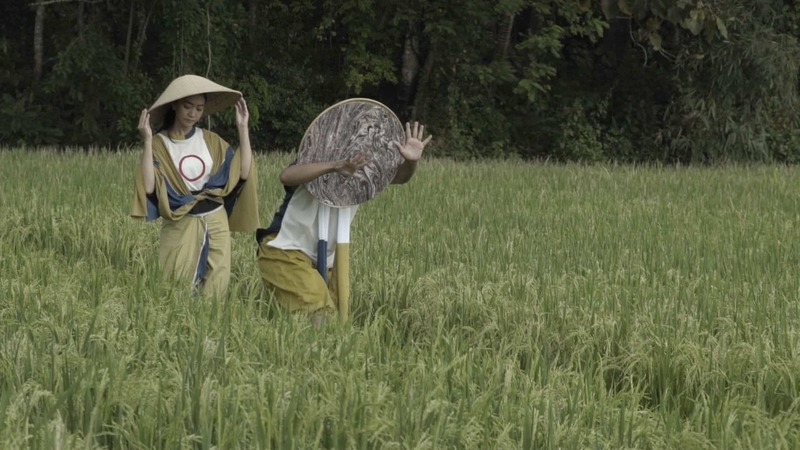 : The ruins on display were inspired by Raku Boko, the archeological site in Yogyakarta and one of our shooting locations. There, I decided that my exhibition would follow a parallel direction and present the actual ruins as a further extension of my initial idea. It was a deliberate decision. This particular area is rife with remnants of historic buildings and temples. However, what resonated with me the most is the structural diversity and a surreal feeling of timeless existence present there. M.S. : How about life on Java today? Is the everyday life of its native citizens really seeped in tradition or are you the only one who finds the region’s history and folklore so profoundly inspiring? M.W. : The past is the present in Indonesia! Traditional dance, outfits and batik painting are still practiced on Java and other islands. Over time, some elements have been modified. For instance, the duration of dance performances, which traditionally lasted for hours, is now limited to about sixty minutes only. Besides, martial arts are commonly taught at PE classes in schools. It’s the way of life, after all. M.S. : You statement says you work best while travelling. Could you elaborate on that? M.W. : The excess of stimuli inspires me to write down thoughts that strike me on my journey. When I find myself in a peculiar travel-induced position, all I want is to do is immerse myself in the experience, to live and breathe the climate, to observe and thus understand more and more about the place. There’s something positively greedy about this impulse. Moreover, the phrase “I work while travelling” denotes a state of mind, a greater attention to detail and observation, which means that you can also “travel” around the city you live in. M.S. : The writing process seems an integral part of your artistic practice. 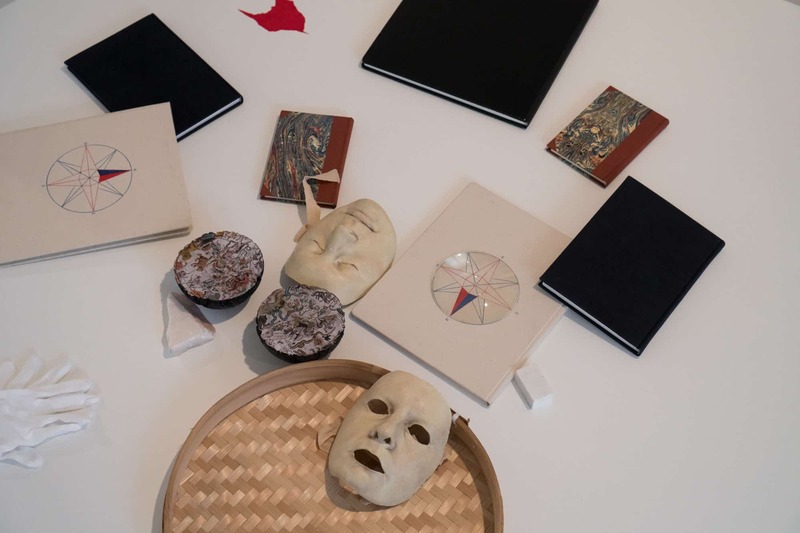 You write essays for artbooks, journals and poetry, some of which were showcased in the exhibition. One of your artbooks is entitled Exotics – what does the title stand for? M.W. : Exotics is one of my student projects. The eponymous subject’s subversive quality emerges from describing an excursion into your close surroundings or vicinity, as if you have ventured into some new exotic territory, which brings me back to the point I made about the nature of travel itself. Upon your arrival in another state of consciousness, you accept the unfamiliar and unknown. That’s the feeling you get when you visit remote exotic places. I hadn’t realised the true meaning of exoticism until I travelled to Indonesia. In fact, exoticism operates on two separate planes. First of all, I’ve always tried to experience the reality in Indonesia in the most objective fashion possible, untainted by stereotypes. As the end of my stay approached, I became aware of the cultural clichés, which I embraced unwittingly, e.g. a visual disparity. In my opinion, the majority of foreign visitors is captivated by this cultural phenomenon, by the things they find strikingly different, unfamiliar. On the other hand, this logic cuts both ways. Everything the foreigners represent is alien to the natives. MS: Certain values are shared by all people regardless of their cultural background. What sort of universal meaning does your work carry? M.W. : The categories of gravity and downfall in relation to human existence were both of paramount importance to me. I pondered this broad subject while I was working on the whole concept. My stay in Indonesia was a deeply personal experience. From the moment I set foot in this strange land, I felt something wavering inside. In the face of all these overwhelming differences, I had to reaffirm my identity. Am I the same person I used to be before I landed on this island? The cultural shock and clash made me realise that no sense of certainty and balance can be achieved in one’s lifetime. In the film, I took a departure from my own experience to portray this issue more universally. Additionally, the tendency to collapse occurs in nature and geology. 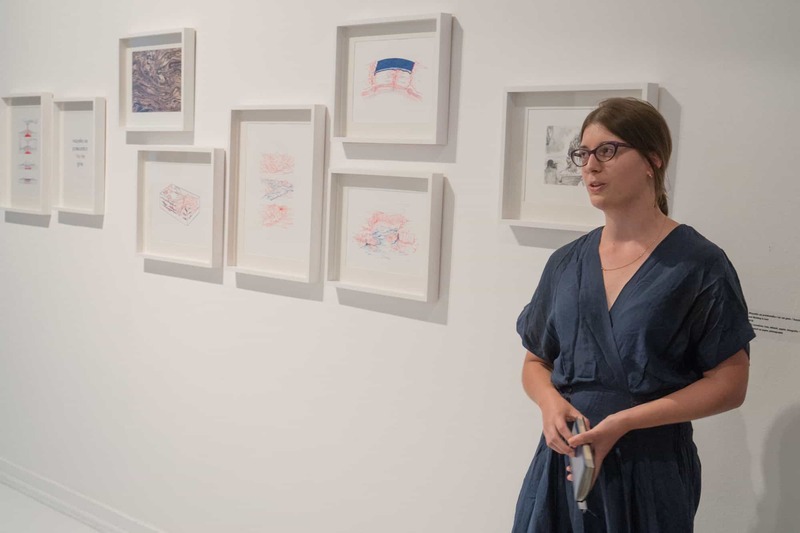 A series of drawings illustrating the notions of decline, erosion, mountain-building events and volcanic activities was also presented at the Zachęta Project Room. The motto of the exhibition placed in-between these drawings reads, “everything changes, nothing ever dies.” Collapse does not necessarily equal failure.